Beef Stew in Red Wine, with Bacon, Onions, and Mushrooms - for 6 people) This is a take off on a recipe from Mastering the Art of French Cooking. If it is prepared a day ahead, it gains in flavor when reheated. Boiled potatoes are traditionally served with this dish. Buttered noodles or steamed rice may be substituted. If you also wish a green vegetable, buttered peas would be your best choice. - Preheat oven to 450 degrees. - Cut up bacon in small pieces and cook over moderate heat. Remove to a side. Add the oil to the bacon fat and heat the pan until the fat is almost smoking before you saute the beef. - Dry the beef with dish cloths; it will not brown if it is damp. Saute it, a few pieces at a time, in the hot oil and bacon fat until nicely browned on all sides. Add it to the bacon. - In the same fat, brown the sliced vegetables. - Place the beef and bacon in oven proof casserole and toss with the salt and pepper. Then sprinkle on the flour and toss again to coat the beef lightly with the flour. Set casserole uncovered in middle position of pre-heated oven for 4 minutes. Toss the meat and return to oven for 4 minutes more. (This browns the flour and covers the meat with a light crust.) Remove casserole, and turn oven down to 325 degrees. 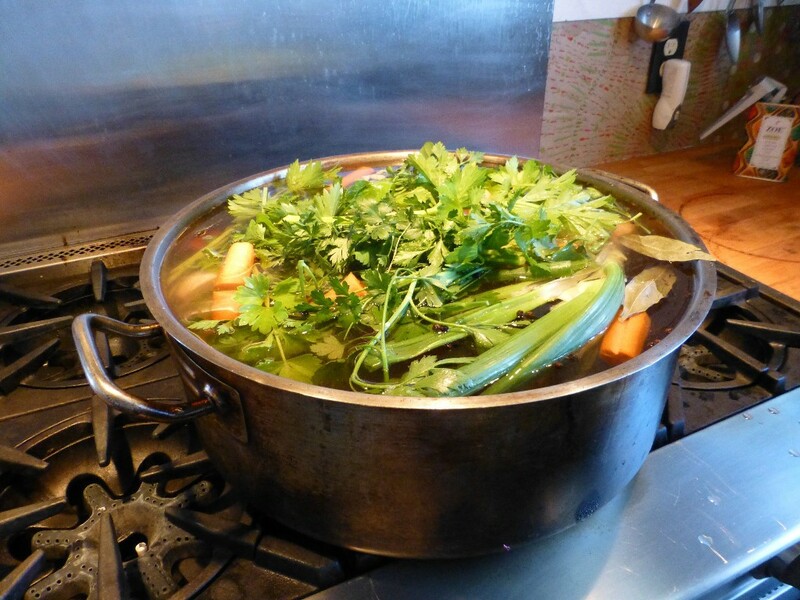 - Stir in the wine, and enough stock or bouillon so that the meat is barely covered. Add the tomato paste, garlic, herbs, and bacon. Bring to simmer on top of the stove. Then cover the casserole and set in lower third of preheated oven. Regulate heat so liquid simmers very slowly for 21/2 -3 hours. The meat is done when a fork pierces it easily. - While beef is cooking, prepare onions and mushrooms. Set them aside until needed. Brown onions in butter, stirring frequently for more even browning, then add stock and simmer for 40-50 minutes. Saute mushrooms in butter. - When the meat is tender, pour the contents of the casserole into a sieve set over a saucepan. Wash out the casserole and return the beef and bacon to it. Distribute the cooked onions and mushrooms over the meat. - Simmer sauce for a minute or two, skimming off additional fat as it rises. You should have about 2 ½ c of sauce thick enough to coat a spoon lightly. If too thin, boil it down rapidly. If too thick, mix in a few tablespoons of stock. Taste carefully for seasoning. Pour the sauce over the meat and vegetables. - Recipe may be completed in advance to this point. - For immediate serving: Cover the casserole and simmer for 2-3 minutes, basting the meat and vegetables with the sauce several times. Serve in its casserole, or arrange the stew on a platter surrounded with potatoes, noodles, or rice, and decorated with parsley. - For later serving: When cold, cover and refrigerate. About 15-20 minutes before serving, bring to the simmer, cover, and simmer very slowly for 10 minutes, occasionally basting the meat and vegetables with the sauce.